The b9460 Motorised wheel balancer. The John Bean Balco b9460 is the 3rd balancer in their new range of V.P.I. (patented) system based machines. Ensuring a consistency of measurement and readings. A wide range of Adaptors such as motorcycle adaptors, centerless wheel adaptors and light truck cones are available for all of the wheel balancers we supply. 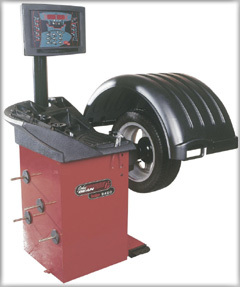 Please go to our wheel balancer adaptor section for more information.